« Madeleine Pan + Test Recipe. 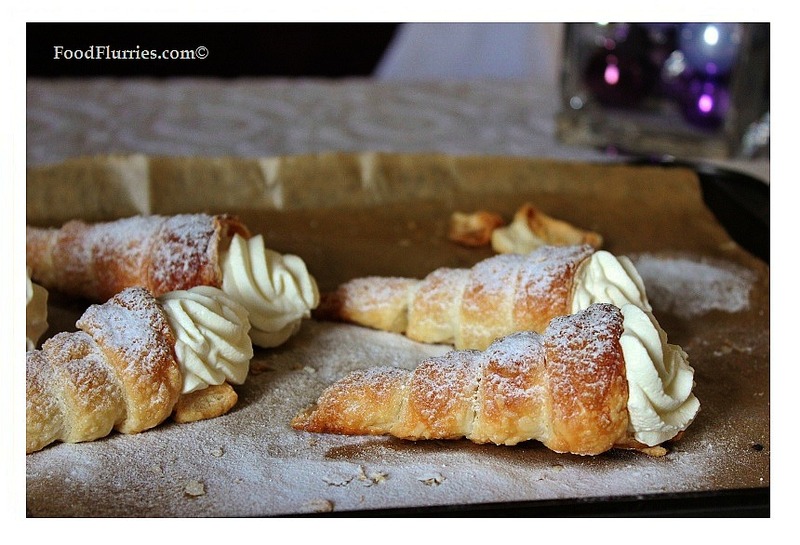 Cream horns bring back a lot of memories. The last time I ate one was when I was still in primary school. It is such a delightful pastry to have, inspite of its simplicity. There is nothing more to it than strips of puff pastry wrapped around a tin mould, baked and then filled with cream and fruit preserves, yet I think every bakery should have these on their shelves. Perhaps it is my own skewed perception, but I think cream horns have gone rather out of fashion with todays people, who demand towers of multicoloured French macarons and posh eclairs over the humble cream horn. 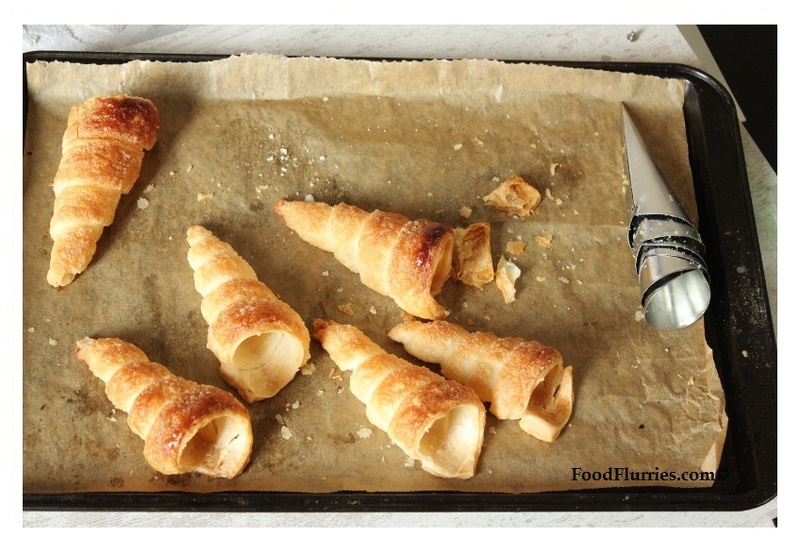 Growing up, our local bakery had these horns filled with cream and chocolate sprinkles … and they didn’t use puff pastry either. They used (I pressume) leftover fortified bread dough which they used to make the milk buns and chocolate chip buns. So in effect I wasn’t eating pastry, but a conical bun with cream. I didn’t care. All I really wanted was the cream filling anyway. 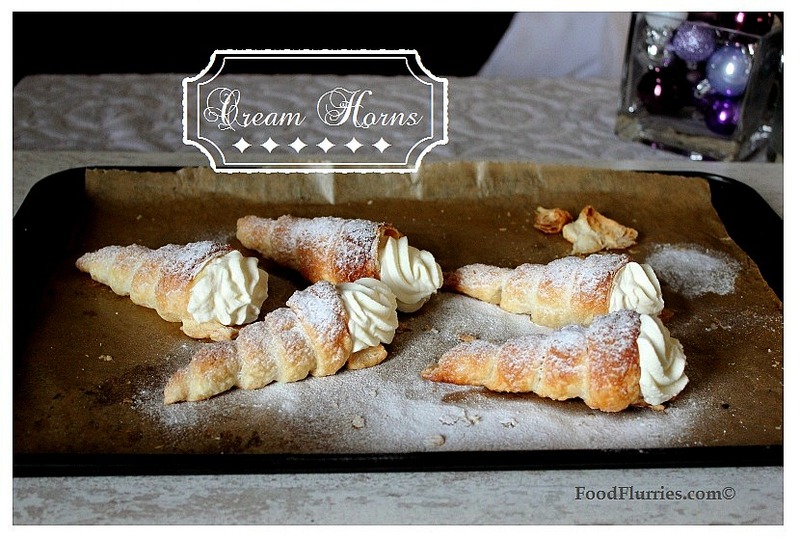 Making cream horns is a surprisingly easy task, so long as you have the moulds. It uses a handful of very basic ingredients and takes no longer than 15 mins to bake. I got my moulds off eBay from a Malaysian baking supplier in Penang (fancy that!). I got six cones for the very reasonable price of € 3.20. Why buy all the way from Malaysia? Coz all the other retail sellers in the UK wouldn’t post their merchandise to the Netherlands … humph. If you are using a store bought puff pastry, then you’ll need to bring it up to room temperature first. You can find puff pastry in the frozen foods section of your supermarket, usually where they keep the frozen berries and things. Depending on there you live, they come in a variety of forms …> blocks that need rolling, pre-rolled and pre-cut squares or a log roll, like the one I’ll be using today. Before you start, thoroughly wash and dry the cone moulds. I use hot soapy water, then I dry them in the oven to ensure no moisture is left on the inside to cause rust. Then rub a little vegetable shortening all over the cone moulds and line them up on a cookie sheet that has been lined with baking paper. Cut 1″ strips from your thawed pastry sheet, and starting from the pointed end, start wrapping the pastry around the mould until you have reached the top. Make sure the pastry overlaps the bottom layer slightly and that there are no holes. Set aside, seam side down, and complete wrapping the rest. 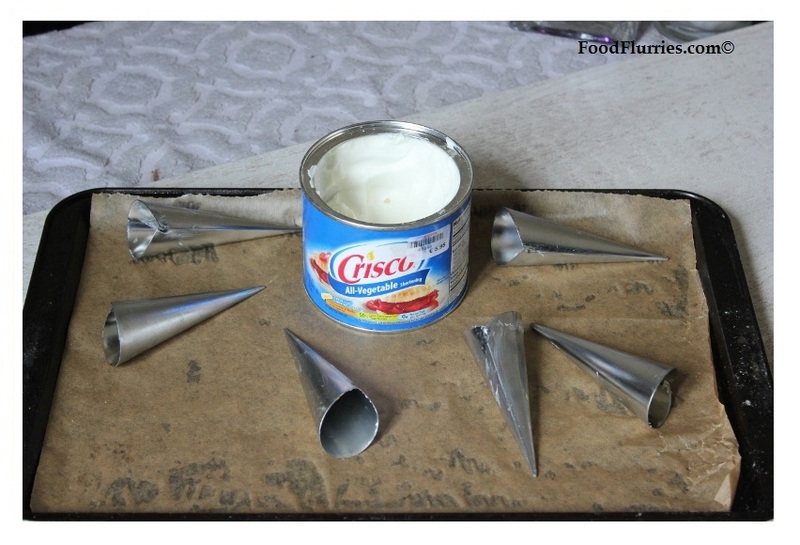 Now take a pastry brush and lightly moisten the top surface of each cone. Then roll this wet surface in sugar. Tap off the excess and place back on the cookie sheet. Place in a 200ºC pre-heated oven and bake for 13 – 15 mins until puffed and golden. Watch out for the sugar coating tho, they caramelize rather quickly. So if they are starting to brown too much, turn down the heat to 170°C and gently bake until the pastry shells are cooked through. Remove tray and allow the cones to cool and harden at room temperature. Once cooled you can gently wiggle the moulds out of the pastry and allow further cooling to take place. 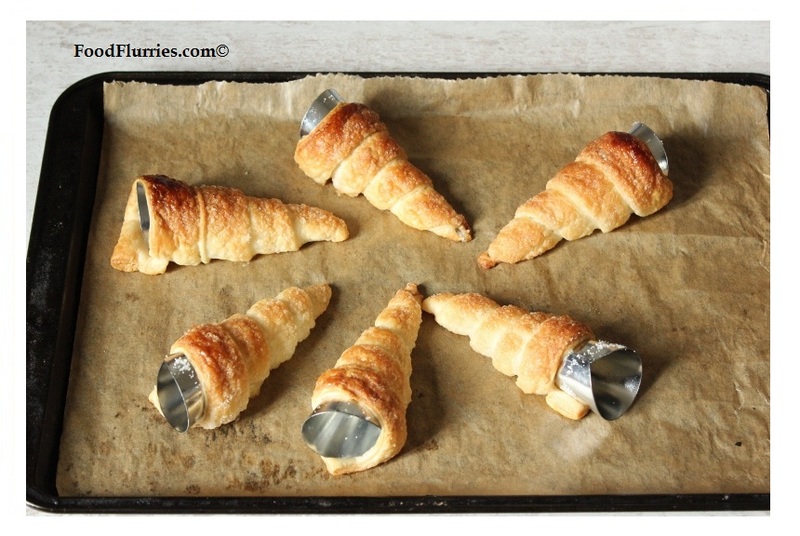 To serve, fill the bottom of each pastry cone with either jam or chocolate ganache, then top up with Chantilly cream. Personally I feel that the best filling would have to be pastry cream, coz let’s face it, it’s yummilicious … but ganache gets my vote too. I didn’t feel like making pastry cream so in today’s recipe I used chunky apple compote in the base. Super yummy! This article goes out to Claire back home in Malaysia ~ I hope she will be inspired and motivated to step into her kitchen after reading this, and make some for herself (Claire, it is easy to make laaaaaaa!). Claire has been to hotel management school before and has undertaken a culinary course as part of her module, but she actually hates cooking. She says she knows how to debone an entire chicken, yet you won’t find her making you a meal when you drop by her place. She prefers fixing your PC if you have a virus onboard. Anyway, even if Claire fails to try out this recipe herself, I do hope you will and that the results will be as delicious and as visually appealling. If you are serving these for an afternoon teaparty, then you can bake the empty shells a day before and store them in an air tight container at room temperature. Fill with cold fillings just before serving, along with a light dusting of powdered sugar. It’s not hard to make all these yourself. Puff pastry + whipped cream + sugar. Sorted. Course you can … so long as you wake up early enough to make them. 🙂 Alternatively, you can place an order with me; that works too.